Our CHC Design Team provides home staging services in Dallas, TX and surrounding areas. Home staging is proven to help sell homes faster and at a higher profit margin. Check out our CHC Instagram page below to see more examples of our furniture and staging projects. Email us at captivatinghomecollection@gmail.com to learn more about our services. Home staging works because it considers the wants and needs of buyers and taps into their emotions when searching for a home. Realtors who work with buyers say most buyers are willing to offer more money for a staged home compared to one that is similar but not staged. 81% of buyers say home staging makes it easier to visualize the property as their future home. Our CHCLLC Design Team loves home staging! We will work with your budget and design preferences. We can stage a completely empty property or redecorate your home using new items we have in stock and your furniture! Email captivatinghomecollection@gmail.com for more details! I hope you are having a great 2016 so far! This post is designed to share information on the importance of upgrading your home! According to Remodeling Magazine (http://www.remodeling.hw.net/) you’re less likely to recoup your investment in a major kitchen or bathroom remodel than you are to get back what you spend on basic home maintenance such as new siding. Siding replacement recouped 92.8 percent of its cost, according to the study. The only home improvement likely to return more at resale was a minor (roughly $15,000) kitchen remodel, which returned 92.9 percent. Replacing roofs and windows were also high on the list, returning 80 percent or more at resale. I also recommend checking out the site below for new home decor and furniture. 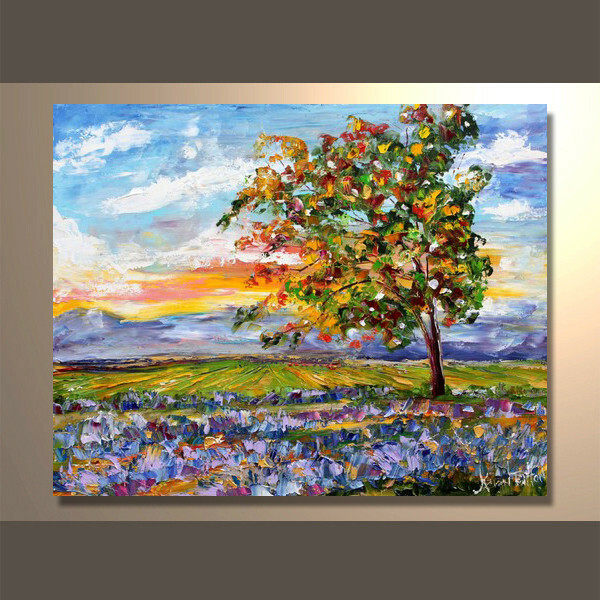 Invest in Your Home and Art! Your home is where your heart is. If you work hard, you should come home to a place that you love. I feel a great investment is in quality home decor items that can last a lifetime. Visit this site below to see beautiful pieces of handmade art and furniture. Check out Captivating Home Collection, LLC! Have a Happy Holiday and New Years! 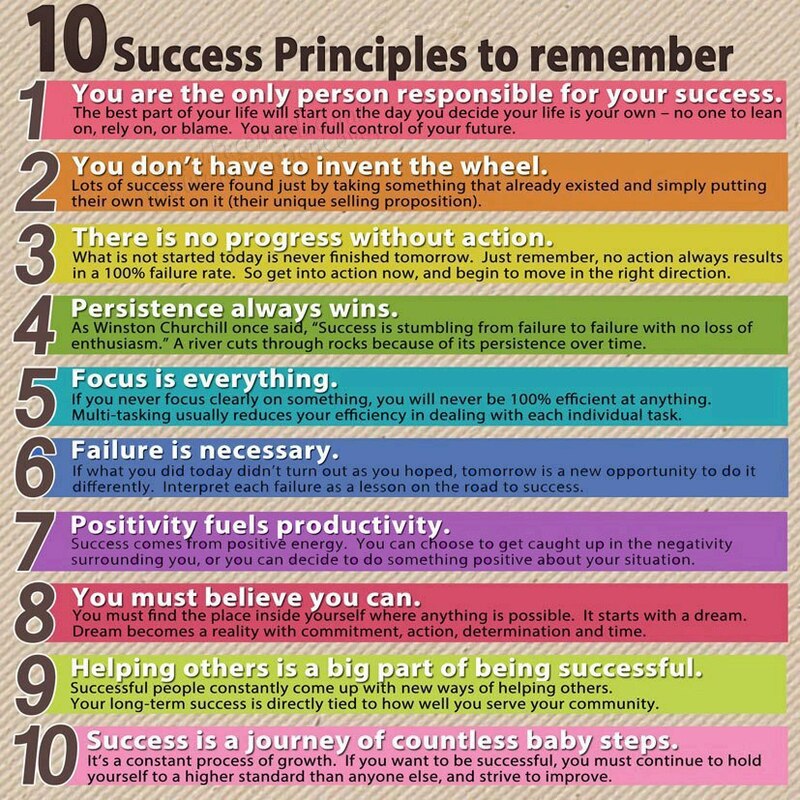 10 Success Principles to Remember! I found this picture and no caption was needed. 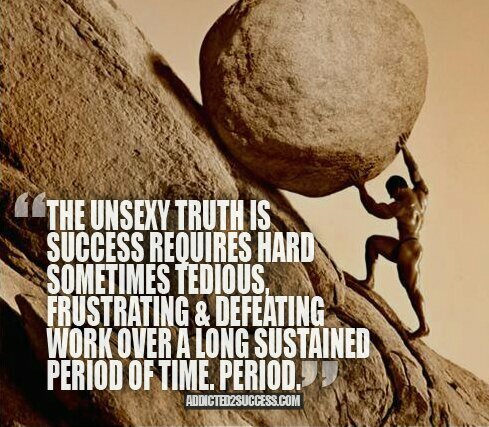 It’s important to remember that there isn’t a easy path to success. Find the motivation you need to push yourself for greatness! If you believe you can do, do it! I’m remembering Dr. Martin Luther King, Jr. today and everyday! Spread love and not hate! It’s 2014 and you have to decide how important success is to you. A lot of people complain that they are unhappy at where they are in life. It’s time to throw out the old ones and start creating new goals. I believe taking small steps can later create large leaps! Success starts with you! Try reading a new book or attending a seminar about creating success in your area. I believe in order to be the best, you need to learn from the best. 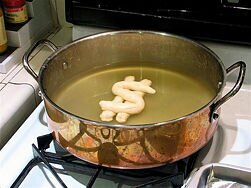 Try Cooking Today to Start Saving Money! I know many of you like me have very busy lives. Cooking everyday can feel like more of a chore than anything else. Did you ever stop to calculate how much money you are spending eating out vs. cooking at home? I never went to culinary school, so my dishes can often taste very basic. What I have discovered are great recipes that are super easy to make. Trust me, if I can do it so can you. The other thing to think about is how unhealthy processed and fast food is. To start the path to clean eating is by preparing and planning your meals in advance. The worst way to start cooking at home is by waiting till you get off work. Usually, when I get off all I want to do is go to a drive thru line. All you have to do is find a good recipe website and there are many out there! I was on a budget this week and I made a super easy dish using chicken thighs. To make this dish healthier, I did not eat the skin. I served it with rice and a salad. Click the link below to try this recipe. Try this easy dish! 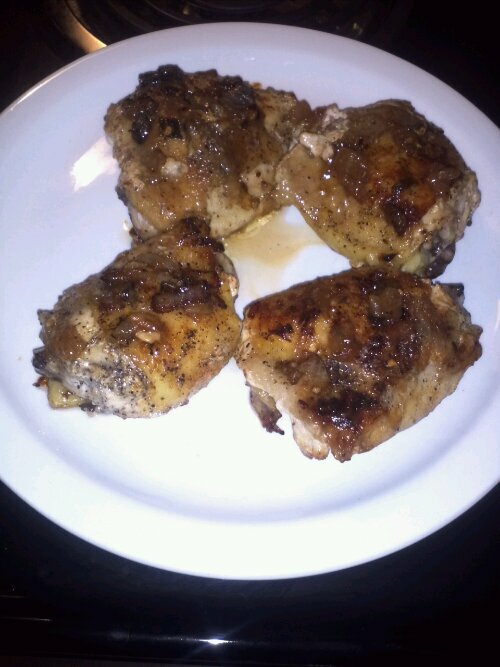 Roasted chicken thighs! I hope you start thinking about all the money you can save by cooking at home.